Age groups range from 5 to over 50. We have many families, mums and dads with kids. If you are under 10 years of age, you need to come for trial assessment lessons. There are three classes: Kids Martial Art Class (Ages: 5-8), Kids Plus Martial Art Class (Ages: 5-12), and Open Martial Art Class (Ages: 12+). During the assessment lesson, you will be taught some basic techniques and you will learn the basic routine. Grandmaster Whang will teach, observe and assess your performance, and will let you know if you are able to participate or go on a waiting list. Trial lessons also gives you a chance to decide whether you like to join the Academy or not. Trial lessons are obligation free and free of charge. New students should book the first trial lesson by emailing Grandmaster Whang on wbbatkd@gmail.com or ring Grandmaster Whang on 0413 631 455. Tell us your name, age, gender and the date you would like to come for the trial lesson. On the first day, you should wear loose clothing (t-shirt and track pants) and joggers. Please come 10 to 15 minutes before the start and remember to bring a bottle of water. 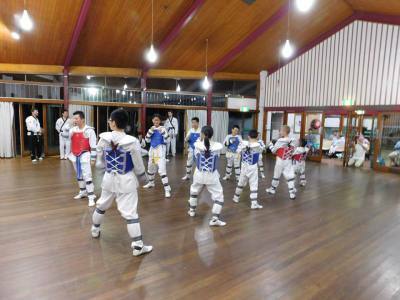 You can expect to be put through warm up exercises, basic punches and blocks, basic self defence low kicks, pad striking (punch, knife hand, palm, elbow), Ssirum (Korean wrestling), hand sparring, stretching, high kicks, Kibon (basic pattern), technical sparring, and warm down exercises. Parents are requested to leave the children on their own for the trial lessons. This is to determine the child's independence and usually children concentrate better when they are not constantly looking at the parent/s. If you are interested in how your child is progressing through the trial lesson, you can drop in casually throughout the trial lesson. Please collect your child after the trial lesson and come and talk to Grandmaster Whang. There is no application, registration, federation or insurance fees. Learning Taekwndo is an individual pursuit that requires dedication and commitment. In case you weren’t aware, martial arts has one of the best track records for positive impact on school performance of almost any organised, physical activity for children. In fact, there is a fair amount of research that confirms that kids who learn martial arts are able to conquer more obstacles to learning than students with the same difficulties who aren’t enrolled in a program. 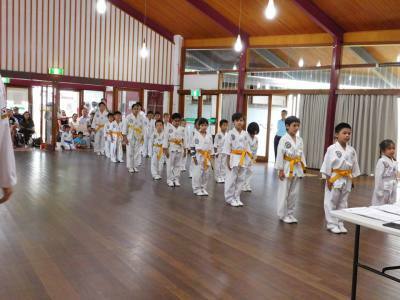 Martial Arts can be the key that opens up educational doors for your child for the rest of his or her life. * Develop confidence to believe they are capable of achieving big things. Martial Arts is about setting goals and trying until you achieve them. The persistence and support teach kids to be confident in their abilities, and that confidence transfers to the classroom. * Self-Discipline to develop healthy study habits. Most of the study of Martial Arts is about learning discipline. Students who can follow through on tough things in our classes can follow through on homework and studying. Concentration to increase learning. Pupils are taught early that not concentrating leads to injuries. They learn meditation and calming techniques that help them to get through their gradings/board breaks. The same benefits stay with them outside of the Academy. See for yourself what Martial Arts can do for your family.